Karthik Nammani attended Unit 5 schools before his family moved to Texas during a State Farm transfer. 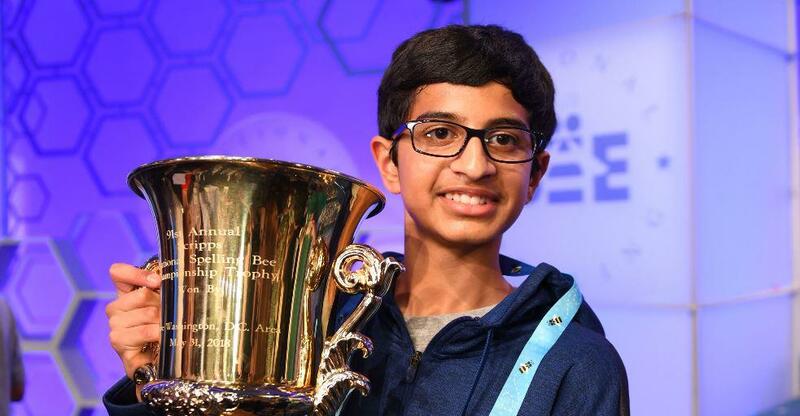 2018 Scripps National Spelling Bee Champion Karthik Nemmani lists his home as McKinney, Texas. Until last year, though, he lived in Bloomington-Normal. Nemmani grew up in the Twin Cities and attended Grove Elementary and Chiddix Junior High schools in Unit 5. The 14-year-old Nemmani outspelled 515 contestants overall and 41 finalists this week, winning on the word koinonia, meaning spiritual communion. Some of the other words he correctly spelled included condottiere, miarolitic, cendre, ankyloglossia, grognard, passus, shamir, jagüey, and haecceitas. You can look them up. Though he now lives in a Dallas suburb, Karthik is still remembered in Unit 5. His family moved to McKinney as part of a State Farm Insurance transfer. His 7th grade composition and literature teacher is Natalie Chambers. "He was kind of your dream kid as a teacher. He was a very hard worker, really inquisitive, analytical thinker, you could always see the wheels turning. Whenever kids were working independently or quietly, you could just see, his brow was always furrowed and he was always thinking," said Chambers. Chambers said Karthik's writing was good for his age, well constructed and (of course) his spelling was good, though she said that's a bit of a lost art in this age of texting and emoticons. Personally, he was fairly quiet. "Once he came out of his shell a little bit and got to know you, he could have a really silly witty sense of humor. He was just the sweetest and one of the smartest kids I had," said Chambers. Chambers said she has now watched some of the footage from the competition in Washington, D.C., and is so happy for him. "What I was most surprised about was how confident and comfortable he appeared with all that pressure he must have been feeling. And to have such a quiet kid shine like that and be so successful under that pressure, I'm so proud of him," said Chambers. She said Karthik's success speaks for the literacy focus Unit 5 has. "To be a good speller takes more than just rote memorization. It requires a love for reading and a love for words and the ability to be open to high-level texts and shows that his teachers were pushing him to his potential as a critical thinker," said Chambers. Adam Symson, president and CEO of The E.W. Scripps Company, presented the championship trophy from the 91st Scripps National Spelling Bee. “This is a grueling competition that takes years of preparation and then challenges the participants all week long. Karthik handled it with grace and maturity. The Scripps National Spelling Bee is a national treasure, and we take great pride each year in seeing the inspiration it brings to audiences across the U.S. and the world,” said Symson. This year's event lasted 18 rounds. Nemmani had never won a state or regional spelling bee before. He qualified under a rule that allowed the field to expand through application if individuals had won a school bee or been a former national finalist. Nemmani received $40,000 and a trophy from the Scripps Bee, $2,500 and a complete reference library from Merriam-Webster, trips to New York and Hollywood, and a school pizza party. Copyright 2018 WGLT. To see more, visit WGLT.